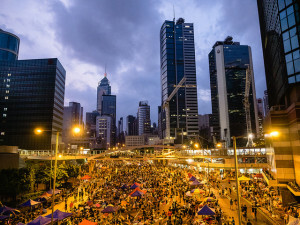 Hong Kong pulled back anti-riot police, but protest crowds continue to grow on Monday as protestors call for election reform and top officials to resign, reports the Bangkok Post. The public demonstrations started on Thursday, September 26 as students led rallies to protest the Chinese government’s plans to hand-pick the candidates allowed to run in Hong Kong’s 2017 chief executive elections. Protestors clashed with police officers on Sunday as the police resorted to using tear gas and pepper spray in attempts to disperse the crowds, according to Bangkok Post. The Hong Kong police force was reduced on Monday, but the crowds of demonstrators continued to grow along with demands for universal suffrage and the resignation of current Chief Executive Leung Chun-ying. Leung called for protestors to stand down or risk China cancelling the popular election in 2017, reports Bangkok Post.